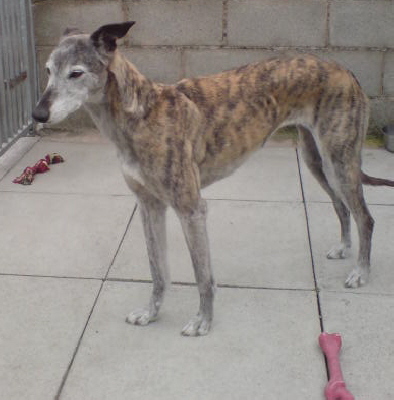 Tigger is a beautiful 10 year old Brindle, female Lurcher who is looking for a new home where she can live out her years in comfort with love and cuddles. Tigger lives with other dogs at the moment, but due to a change in the dynamics at home she is now being bullied by one of the other resident dogs, and as she is also a little nervous of meeting new dogs we feel a home where she is the only canine resident or with one older companion would be best. 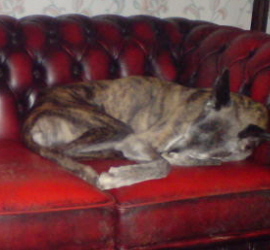 A real home comforts girl, Tigger loves the sofa, cuddles, warmth and her food. She is currently fed a mix of dry complete and meat in the evening, has toast for breakfast and snacks through the day. She would love a home where she will continue to be treated in the manner to which she is accustomed!! Young and active children make Tigger a little wary, so we would only consider homes where any existing children are aged 10 years or over. However she would also make an ideal companion for someone living alone as she is extremely well behaved on lead and knows a number of commands including sit, bed, leave, out and lie down. Currently living in the Accrington area, Tigger spends much of her time with her owner, even going to work with her, so a home where she has plenty of regular company is essential. She thrives when she has lots of human contact, fuss and love. Occasionally Tigger will nip when she is excited about seeing you, but this is never aggression, simply a way of getting your attention. Anyone interested in homing Tigger needs to contact us or telephone Margaret on 07915 017587 for an informal chat. As with all dogs rehomed with the support of Rochdale Dog Rescue an informal telephone interview is required, an application form will be completed and if the home is suitable a homecheck will be carried out. If successful an adoption contract is completed and a donation is usually required. The dog will be neutered or spayed where possible, vaccinated and micochipped.